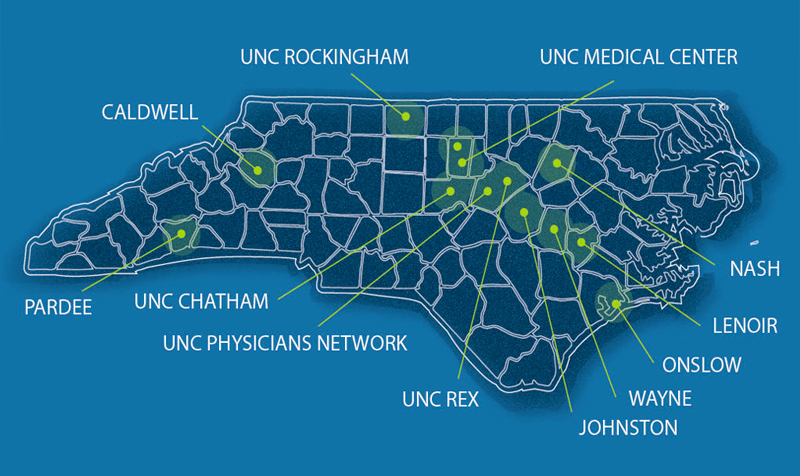 At UNC Health, we work hard to provide the highest-quality care to the people of North Carolina. Every day, our people make sure each patient stays at the center of everything we do. From Magnet recognition to being named one America’s Best Employers by Forbes Magazine, we’re proud to say that our hard work is constantly and consistently recognized, awarded and celebrated. Ranked number 50 on Forbes' list of America's Best Employers. Received the 2014 Secretary of Defense Employer Support Freedom Award, the Department of Defense's highest recognition, given to employers for exceptional support of Guard and Reserve Employees. Eight clinical specialties at UNC Hospitals were nationally ranked, with four specialties ranked best in the state, including the #1 adult cancer program in North Carolina by U.S. News & World Report in its 2016 "America's Best Hospitals" ranking. Received the 2014 Mission: Lifeline® Gold Receiving Quality Achievement Award for implementing specific quality improvement measures outlined by the American Heart Association for the treatment of patients who suffer severe heart attacks. Recognized by Becker's Hospital Review as one of its 2014 "100 Great Hospitals in America." Ranked 2nd in Primary Care and 22nd in Research by US News & World Report Best Medical School rankings. Ranked by the Association of American Medical Colleges in the 86th percentile of colleges whose graduates go on to practice in traditionally underserved areas, in the 71st percentile for practicing medicine in rural communities, in the 63rd percentile for in-state practitioners and in 44th percentile for primary care practitioners. Recognized by U.S. News & World Report as one of "America's Best Children's Hospitals" in the publication's 2014-15 rankings. This marked the 7th consecutive year that N.C. Children's has been ranked among the nation's preeminent pediatric facilities by the publication. Recognized as an American College of Surgeons-verified Level I pediatric trauma center, joining the ranks of only 40 other ACS-verified pediatric trauma centers across the country. Home to one of the only pediatric airway centers in the country. Received the North Carolina Maternity Center Breastfeeding-Friendly Designation from the North Carolina Division of Public Health. Received prestigious international recognition as a Baby-Friendly® birth facility. UNC REX is ranked No. 1 overall of North Carolina’s best hospitals by Business North Carolina magazine. UNC REX is ranked #3 overall in the Triangle and #10 overall in North Carolina by U.S. News & World Report in its 2016 "America's Best Hospitals" ranking. Named 2015 Best Hospital in the State by Business North Carolina, the third consecutive year that UNC REX has received this distinction. Received an "A" grade from the Leapfrog Group on its Hospital Safety Score. Received a five-star rating from Hospital Compare, a consumer-oriented website administered by the Centers for Medicare and Medicaid Services. Chatham was one of only three North Carolina hospitals to receive a five-star rating. Identified as a HEALTHSTRONG Hospital, a network of top performing hospitals rated as a part of iVantage's Hospital Strength Index. Recognized with the Commission on Cancer's Outstanding Achievement Award. Recognized as a 2013 Top Performer on Key Quality Measures by The Joint Commission. Accredited by DNV-GL Healthcare, Inc., an accrediting body authorized by the U.S. Department of Health and Human Services, Centers for Medicare and Medicaid Services. UNC Rockingham Health Care has received ISO 9001:2008 certification, a designation that assures that it has met a host of quality management standards established by the International Organization of Standards (ISO). Received the American Heart Association's Mission: Lifeline® Silver Referring Quality Achievement Award. Awarded the prestigious American Diabetes Association Education Recognition Certificate for its diabetes self-management education program. Designated as a Breast Imaging Center of Excellence by the American College of Radiology. Accredited by the Commission on Cancer. Recognized by the American Nurses Credentialing Center as part of their Pathway to Excellence Program.